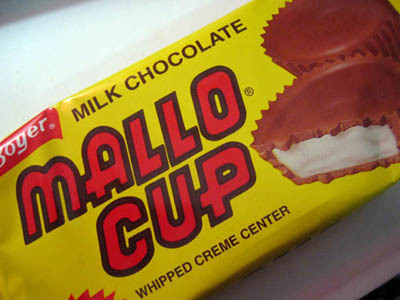 Mallo Cup was first made in the 1930′s by Bill and Bob Boyer who had started a very profitable business making candy. The Mallo Cup was originally a bar, but they were having trouble with the runny marshmallow due to the shape. Their mother, Mrs. Emily Boyer, who had been working alongside her sons in the business, suggested using cupcake liners to contain the marshmallow, and Mallo Cup was born. The cup form was so popular that it spawned the Smoothie Cup (peanut butter center with butterscotch coating) and Peanut Butter Cup (peanut butter filling covered by milk chocolate). I was surprised when I took my first bite of a Mallo Cup because I wasn’t expecting coconut to be mixed inside with the marshmallow. Nowhere on the wrapper (except on the ingredients list) is coconut mentioned, which I found rather strange. I’m so happy it is there though, since it adds a wonderful toasted and warm flavor that rounds out the chocolate and the marshmallow tastes. It’s a candy I’ll eat again and again and never get tired of it. Also, tucked inside each wrapper, is a cardboard play money stub with the numerical value of 5, 10, 25 or 50 stamped on it. These are part of a rebate program that lets you get free candy or merchandise with the “money”. Pretty sweet! I love, love, love these. There is nothing else like it. Around Halloween you can find the single Mallow Cups in the bags. WE LOVE YOUR DELICIOUS CANDY,HAVE ATE IT FOR YEARS, WE SAVED ALL OUR POINTS!!! IS THERE A CATALOG? The best candy period! Nothing even comes close. The only problem is that I can’t find them. Yeah, reward points are just fine… except that it costs more in shipping and stamps to SEND 500 points worth of cardboard pieces to get the advertised dollar rebate. On top of that, a tshirt costs 4800 points. If you get 1-25 points per candy package, that’s almost unreachable. You’d need nearly 200 MAXIMUM value (25 point) cardboard pieces to get it. That’s over 100 dollars for a tshirt. Oh wow, I had my first taste of a mallow cup, I live in Georgia, and i had never seen a mallow cup, at work our vendor left some in the vending machine, i got two packs, i could not help my self, they were so good. now i can feel guilty and not eat for the rest of the day, i am sure i will clean out the vending machine this week, those things were great… i am 40 and this was my first mallow cup. 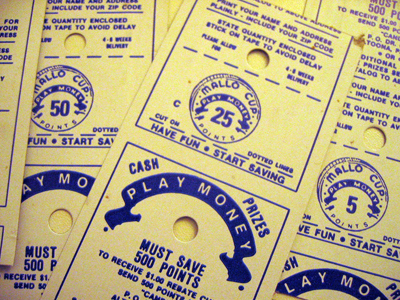 I found a mallo cup play money in an old avon bottle. seems to be kinda old. it is in red print and i am guessing worth 10 mallo money? It has a number on it and an address of P.O. DR.#1431. Just wondering about how old it is. Thought it would be kinda fun. I just received a big box full of Mallo Cup 4 packs!! The first pack was the consistency of stiff peanut butter. I ate that first one and put the whole box in the freezer. After about 20 minutes I retrieved my treats. What delight. The druggies talk about “ecstasy”, I got y’er ecstasy right here. Sad though, no mallo money inside.